Bible apps can come in all shapes and sizes. Some focus on study, others focus on notes, while others focus on a great reading experience. The best Bible app for iOS is The Bible app from YouVersion. It comes with a wealth of translations, great reading plans, audio Bible support, access from almost any device (with note syncing), and it’s frequently updated. 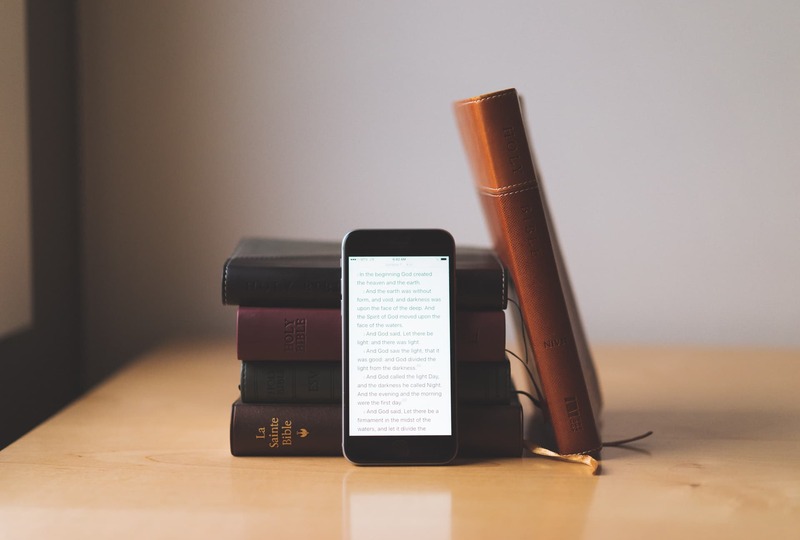 While other apps may offer a slightly better reading experience or better study tools, The Bible App offers the most features of any while still providing a great experience all around. The Bible App is also completely free, with no advertising and no in-app purchases. They also offer a great Bible App for Kids. Before we started looking at Bible apps, we developed a list of criteria that we would consider for each app. 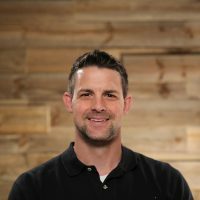 When the iPhone App Store first launched in 2008, we had no idea what we were wanting in a Bible app. Eight years later, we have a very good idea of what we want. In fact, many pastors even use iOS devices for large portions of their study. We polled our readers (via social media) to ask what they felt was the most important criteria. The top four factors that our readers cared about was universal app (iPhone and iPad), offline access, multiple translations, and design/typography. These four were included on over 60% of the entires received. Offline access was the top criteria with it being included on 81% of the entries. We are also considering study material options (commentary, cross references, etc), audio Bible options, note-taking (with sync), and social integration. Does the app follow iOS design standards? Does it provide a great experience from initial launch, reading, and displaying any extras it provides? Is it updated to include iOS 9 features? When it comes to apps that are used for reference, it’s easy to be heavy on features and material while being near impossible to figure out the basics. Does it provide an easy way to access what you want without needing ten taps? While I love the English Standard Version, there are a lot of great Bible translations that are great. From the HCSB, NASB, and NKJV, there are a lot of translations that people use. Does the app provide versatility when it comes to translation options? This is a must-have feature. My iPad is WiFi only, so I need the option to be able to download my preferred translations offline. In the era of podcasts, a lot of people love to listen to the Bible. Do any of these apps provide this feature? A lot of apps support the ability to take notes and have them sync to other devices. We felt like this was an important criteria to consider in our review. Bible commentary and cross-reference materials are important for in-depth study. Do the apps offer this material built-in for free or for an additional purchase? Do these materials integrate into the study experience? Sharing what you’re learning on social media is a great way to encourage people. 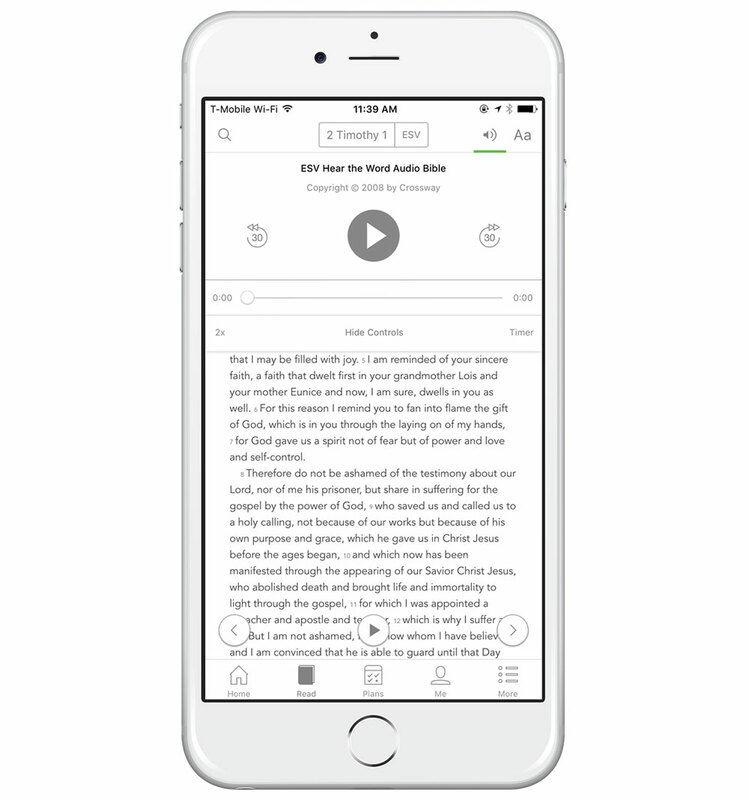 Do the apps offer an easy way to share a verse or a snippet of a commentary? Does the app sync bookmarks, settings, notes, and other personalization options? In a multi-device world, syncing of data is a must have feature. I have multiple Bible apps on my iPhone and iPad. For the best reading experience, I prefer NeuBible. For access to my study materials, I prefer the ESV Study Bible app. For the best overall experience, YouVersion’s Bible app is my go-to app. From a design perspective, it finds a nice balance of simplicity for new users, but also provides depth for long time users. On the iPhone, the navigation is at the bottom, which makes it easy to use for Plus users. On the iPad, it puts the reading experience front and center. The navigation menu can found be by tapping on the menu icon while reading. 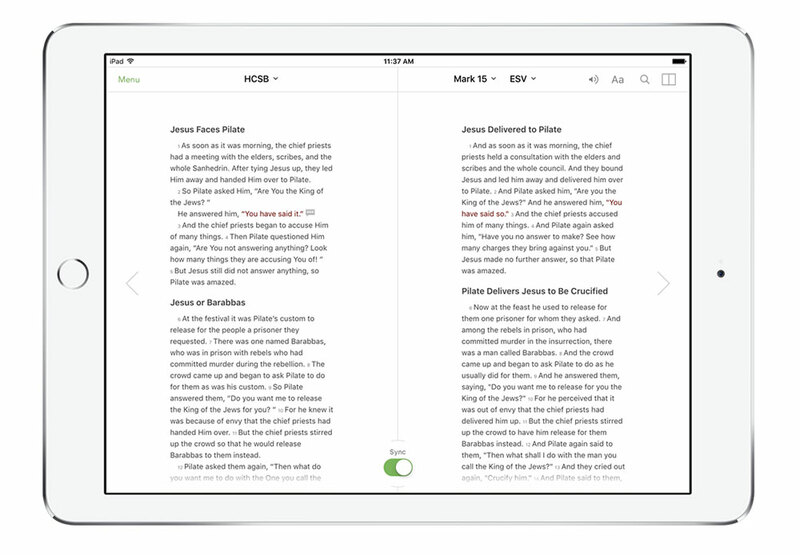 It features an iOS 9-style split screen to keep the Bible on the right, but bring up the home menu on the left. YouVersion offers some great font options (including San Francisco), and also offers multiple themes including a low light option. While the reading experience isn’t as good as NeuBible, it’s a close second. YouVersion has clearly taken pride in not only how it works, but also how it looks. While I prefer the English Standard Version (ESV), I know a lot of people who love the Holman Christian Standard Bible as well. YouVersion includes 1,266 translations in 919 languages (48 in English). This is all for free as well. While the app is free, if you find it useful, I would recommend considering a donation to help continue development. YouVersion also offers the ability to download most of its translations offline so you can read while away from WiFi or LTE. 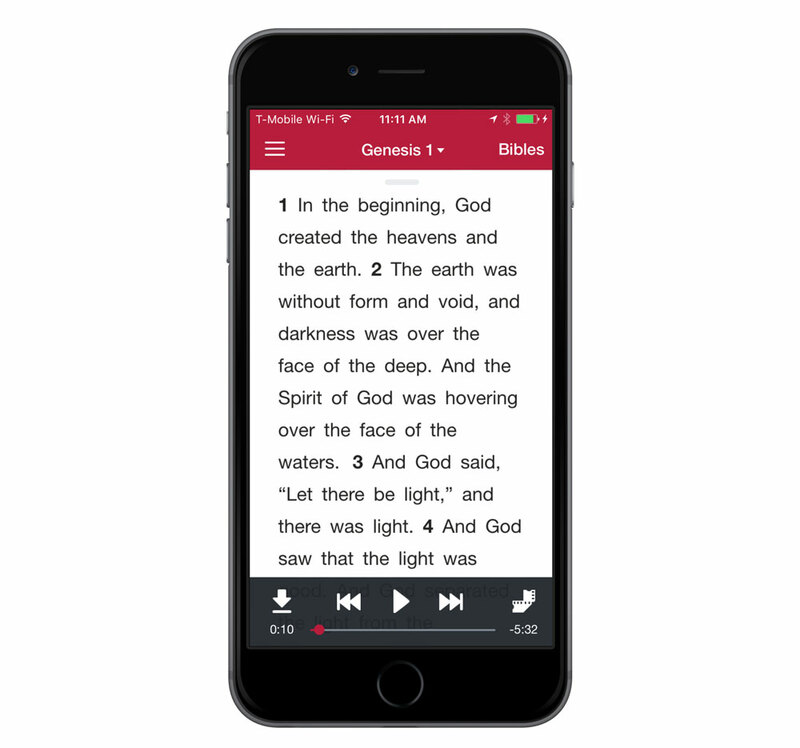 Many Bible apps include built-in audio versions. YouVersion is no different. While it doesn’t include every translation in audio format, it does include a lot of the common ones, such at ESV, NASB, NLT, and HCSB. I love listening to the Bible while I read as I feel it helps my mind stay focused. It even includes the option to slow down or speed up the reading by factors of .5x, 1.5x, and 2x. One of the things that really helps my Bible study time is using the HEAR method of journaling through scripture. This method was developed by Robby Gallaty as a way to help understand the passage. The H stands for highlight (the passage you are reading). The E stands for explain (explain what is happening in this verse in the context of when/why it was written). The A stands for application (how does this apply to me in 2016 based on the context of the explanation?). The R is response (what is my response/prayer based on how this passage applies to me?). The notes I take in the YouVersion app sync seamlessly with the web and other platforms. This feature makes it easy to use on the web, iOS, and Android. While the ESV Study Bible app offers my favorite resources for study, the YouVersion app offers some great Bible reading plans. 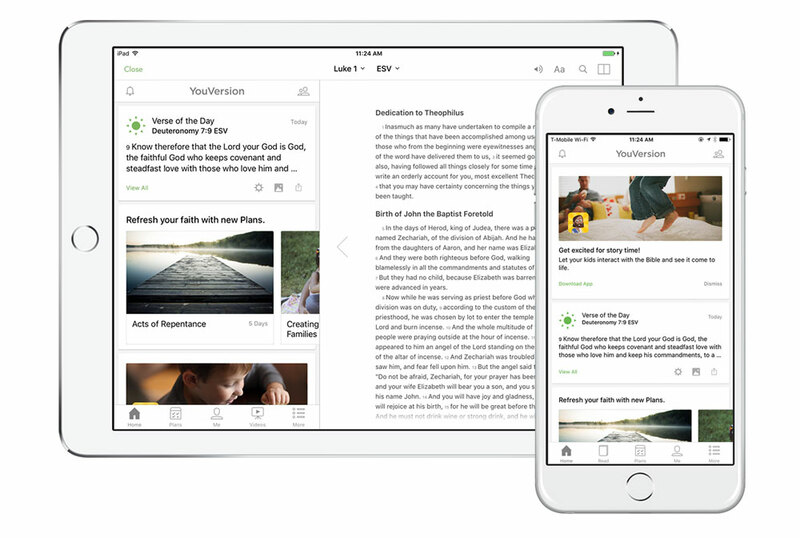 From the “Bible in a year” program, specific topical studies, and family devotional guides, YouVersion is no slouch when it comes to resources. On the iPad, you can also view two translations at a time in order to see how the wording is different in each. Still, I would like to see the option of adding commentaries as well (even as an in-app purchase). If YouVersion only got one thing right (they get a lot more), it would be social integration. You can easily share verses on social media along with a built-in community on Bible.com. You can allow friends to see where you are in your reading plans, and also see where the community at large has written about a particular verse. The app also includes a built-in social image generation for sharing verses with friends and on social media. One aspect that I do wish YouVersion would improve on is syncing your settings. While your place in your reading plan certainly syncs, I’d also like to see the option to sync font, font size, and other reading options to all my devices. I’d also like to see some iOS 9 features like split screen on the iPad added. Overall, YouVersion is hard to beat. 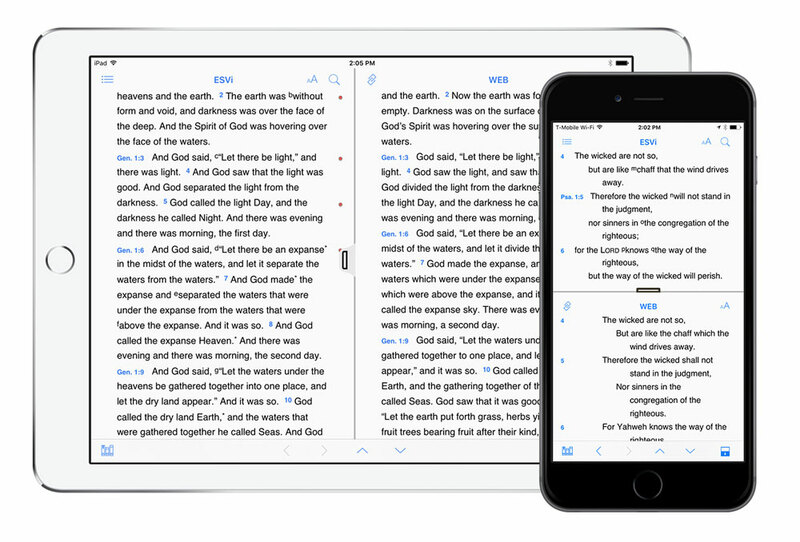 With access on iOS and the web, a host of translations, built-in audio Bible, great typography, and a well-thought-out design, it’s the best Bible app for iOS. While I also rely on NeuBible and the ESV Study Bible, if someone simply wanted one app for the entire Bible experience on iOS, I’d quickly recommend YouVersion’s Bible app. The NeuBible app was developed by Quiet Pupil. Even though it’s our runner-up, it’s the best reading experience on iOS. The iBooks/Kindle teams could learn a lot about the reading experience on iOS from using NeuBible. In reality, NeuBible wasn’t built to win a review of the best Bible apps. It doesn’t include audio Bible support, commentaries, or note taking. It only includes nine translations, and many of them are in-app purchases. NeuBible’s key feature is how minimal of a feature set it includes. It’s about the reading experience. When I want to sit down and just simply read the Bible, I turn to NeuBible. 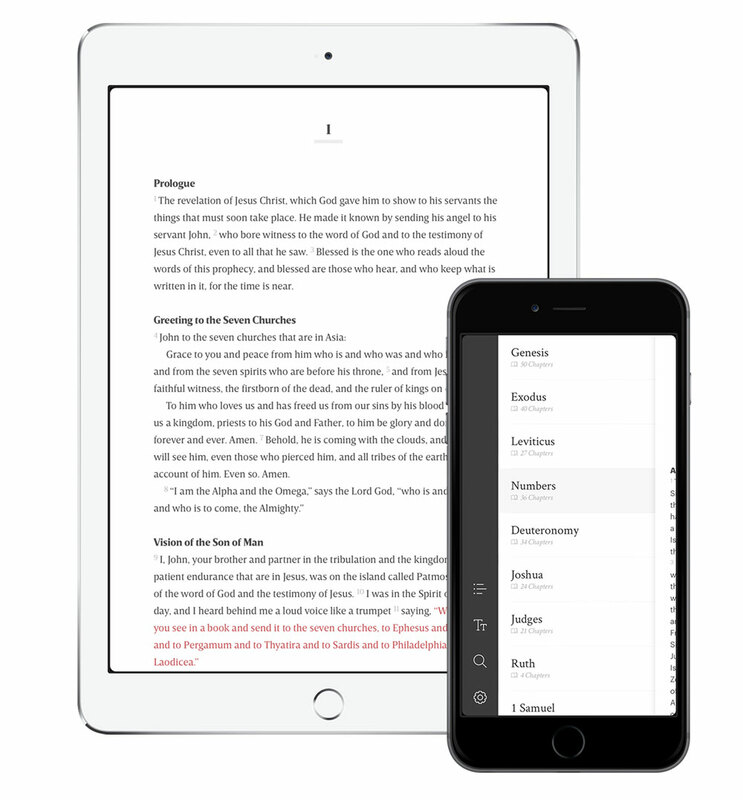 It’s distraction-free, includes an amazing design, and focuses on the most important part of the Bible: the words. A recent update also added an incredible looking iPad app. NeuBible is free, and it includes various in-app purchases for new themes and new translations. As I mentioned earlier, the ESV is my preferred translation of the Bible. Crossway offers a really nice iOS app as well. The ESV Study Bible is a unique commentary in that it wasn’t done by a single author. It includes commentary by 95 Biblical scholars from 9 countries and nearly 20 denominations. It’s my favorite resource for helping me understand a particular passage. 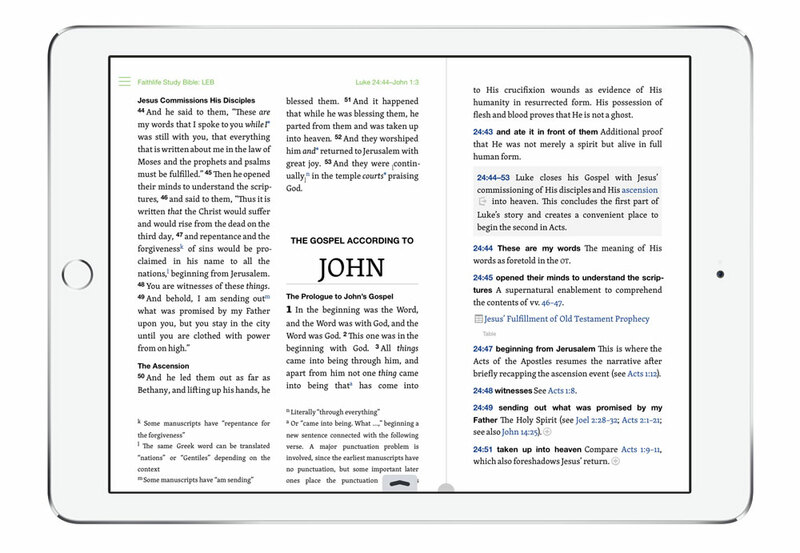 The Study Bible commentary is an in-app purchase for $17.99. If you own the physical copy, you can create a free account to unlock the study materials inside the app. The app includes a nice design and has decent font choices. It includes note syncing and audio Bible support. I love this app. The problem for a lot of people will be that it only supports one translation. If you want the New International Version or the New Living Translation, this app won’t be very useful to you. 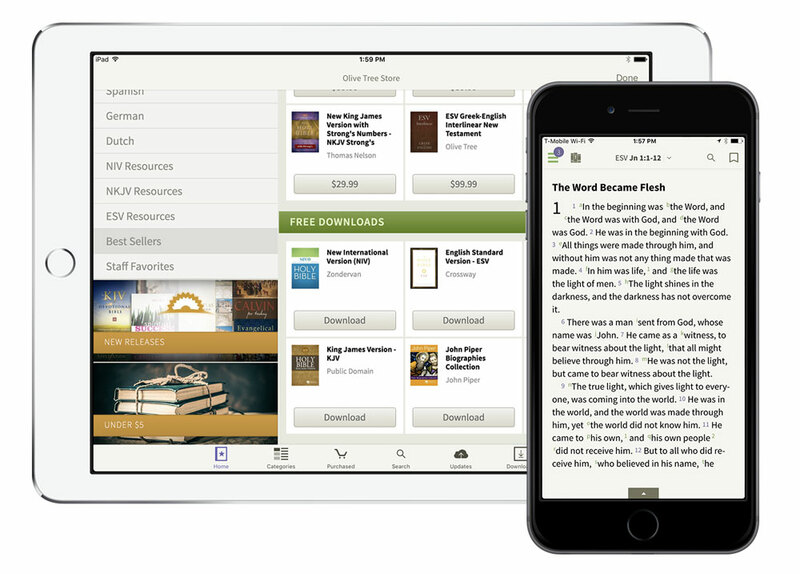 The ESV Bible app is available for free on the App Store. Among pastors, Logos is extremely popular. The desktop versions are extremely powerful. Possibly the easiest way to explain it is as having a full-time research assistant at your fingertips. You can build an extensive library of thousands of books (Bible translations, commentaries, and other reference material) that can work in tandem with your study. Let’s say you are studying 2 Timothy 2:2. You can open the passage in Logos and then open up any book in your library to where it talks about that verse. It’s as much of an ecosystem like Kindle or iBooks as anything. For most of the pastors that I know, it’s their platform of choice. On the iOS side, it’s extremely well done if you are a Logos customer. It comes with 70 free books, the ability to create private groups, and the ability to download your content offline. 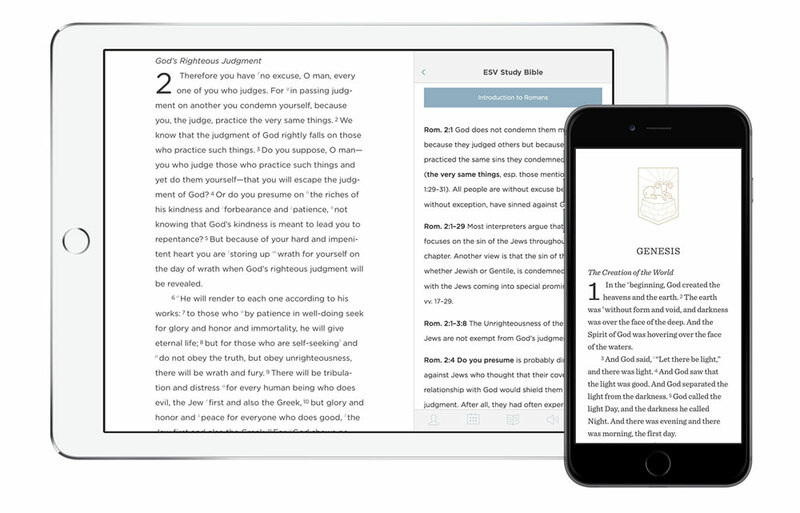 It has also been updated to work with split-screen on the iPad, and it also supports split between the Bible and commentary resources inside the app. My main complaint with Logos is that if you are not doing sermon preparation, it can be overkill. It can do deep word studies and other type of research that the average person isn’t going to use. Because it can do so much, it becomes quite confusing if you simply want to do a little reading with basic commentary. If you are already a Logos customer, I’d highly recommend it. Otherwise, I think it’s overkill for most people’s needs. Logos is free on the App Store and has options for in-app purchases for additional resources. Bible+ by Olive Tree is a well-known Bible app on iOS that is developed by Harper Collins Publishing. It has apps for iOS, Mac, and the web that feature a really nice design, but from a user interface perspective, it’s a bit overwhelming to me. There are ​a lot​ of options to pick from. The reading experience is fairly nice (lots of font options), and it allows you to add in commentary in a split screen like Logos. All of your information syncs with their Mac app as well. If you are looking for something a little less than Logos, but more than YouVersion (with a native Mac version), then Bible+ is a great choice. You can get a handful of translations for free, and there are multiple commentaries you can purchase. You can download Bible+ by Olive Tree for free on the App Store, and it includes various in-app purchases for additional resources. Accordance, like Logos, is a very serious Bible study tool. It’s an ecosystem of content that works across all of their apps. 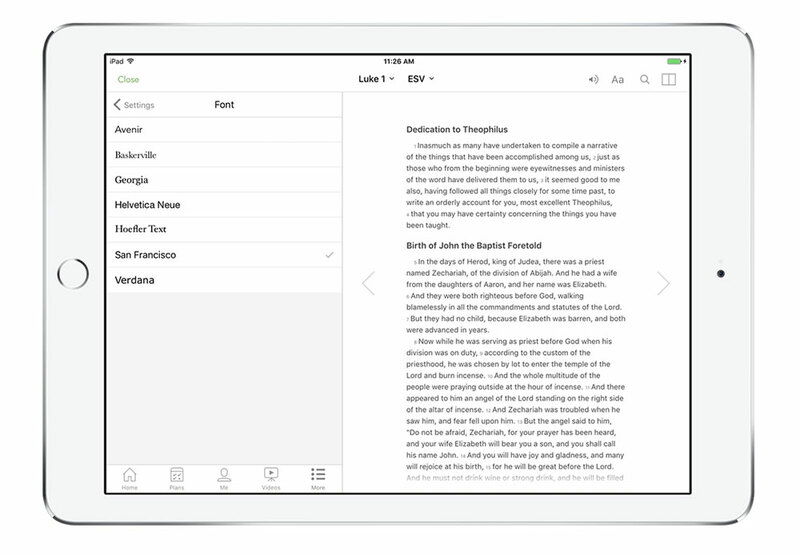 If you use Accordance in your sermon preparation, you’ll love their iOS apps. For the average user, I feel that it’s even more overwhelming than Logos. It does support split screen view on iOS 9, so the developers are keeping it updated with modern iOS features. It can be downloaded for free on the App Store. In-app purchases range from $14.99 and up for translations and various study materials. If the Faithlife Study Bible app looks familiar, it should. It’s developed by the same company behind the Logos app we discussed earlier. It’s a little less overwhelming than Logos, but it’s still not as user friendly as YouVersion or as great a reading experience as NeuBible. 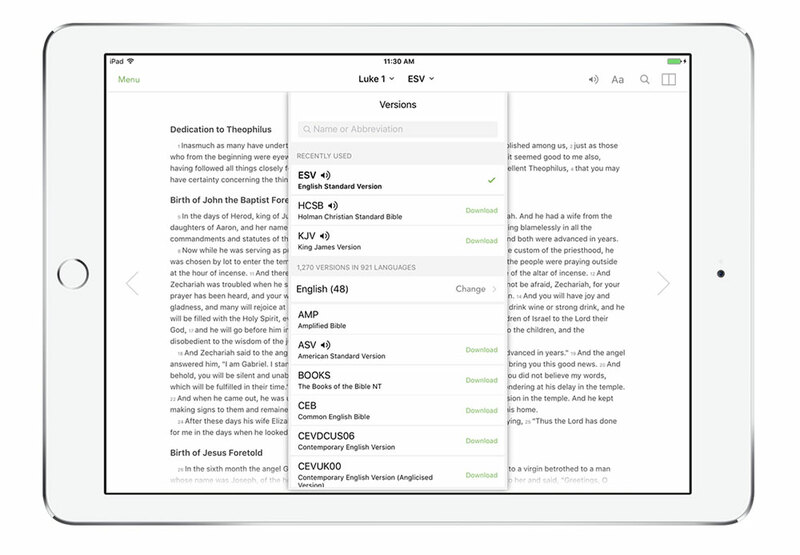 It only comes with the Lexham English Bible, but others can be added through in-app purchase. Translations such as NIV and ESV start at $9.99 to upgrade. You can download the app for free on the App Store. 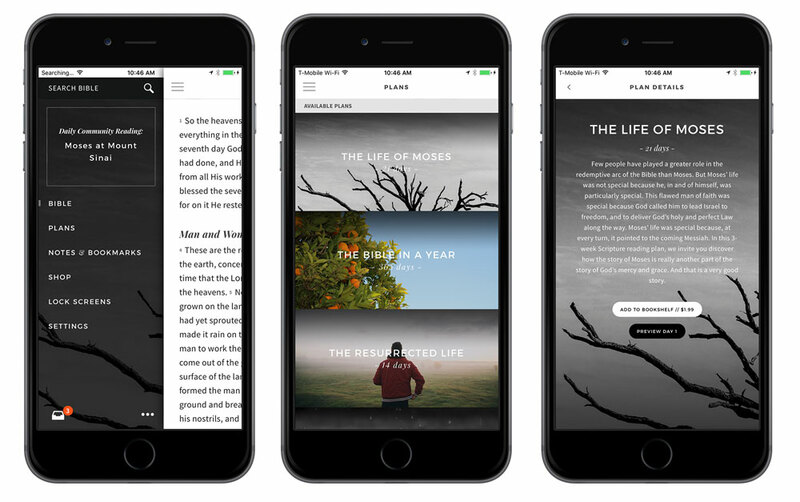 Bible.is is mainly built for an Audio bible experience. It has not been updated for the larger screens of newer iPhones, but it is still functional. One advantage it has over other apps that include audio Bibles is that it supports offline downloading of the audio. It includes dramatized versions in over 1,000 languages. You can download Bible.is for free on the App Store. The He Reads Truth and She Reads Truth apps are some of the newer apps that I looked at. I found the app to be pleasant to use. It includes six popular translations for free, some really well-done Bible studies (usually a $1.99 in-app purchase), built-in note syncing, and some great social sharing options (I see their screenshots shared on Instagram quite a bit). It’s an app to watch long-term, but its current feature set it too limited compared to the other apps. Bible Gateway includes a lot of translations, audio Bible support, and reading plans. It’s also ad-supported (which just looks odd in a Bible app), and has yet to be updated for the iPhone 6 and 6 Plus screen resolutions. It can be downloaded for free on the App Store. 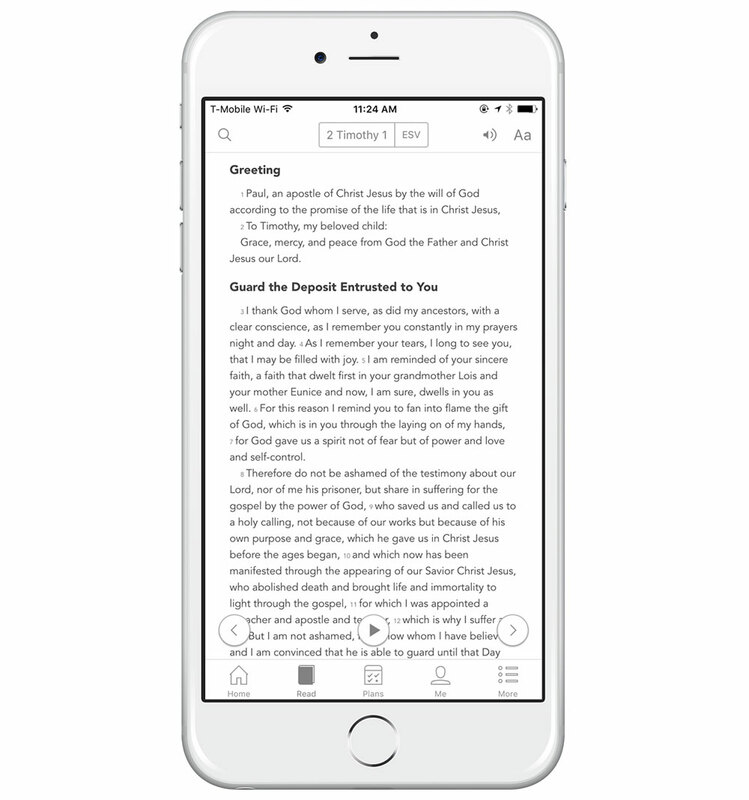 The Replicate app was built for the Foundations Bible reading plan and the HEAR method of journaling. It includes the ESV and HCSB as translation options. It has options to build a community group within the app to share journals and prayer requests. There are a lot of great options out there for Bible study on iOS. From light reading to heavy sermon preparation, there is something for everyone. It’s exciting to see that a lot of the apps are focusing on great typography and design. Day to day, I use YouVersion and NeuBible. When I want to access my ESV Study Bible notes, I launch that app. This is typically done when preparing to teach a life group (modern day term for “Sunday school”). If you are a pastor, I encourage you to check out Logos and Accordance for in-depth sermon research. All of these app are free to download, so you have no reason not to check them out for yourself. YouVersion's Bible is the best overall experience because it's easy to use, supports many versions, and provides a great reading experience.